When going on holiday and handing over a social media account or talking to a new member of staff, I often show a rough ‘how to deal with people on social media guide’. Hopefully, you or someone in your team will find this flow chart handy. If you think it’s useful, you can download a PDF. Share this chart with your Twitter network: tweet about this chart. 03/06/14: Note – I forgot to say, this image is issued under a ‘steal, modify, scribble on or take the piss out of’ licence (that I just made up). If you have a use for it, go ahead – it’s a present from me! If you like this chart, maybe you might like one of these social media courses. Whether it’s how to increase engagement with your Facebook posts, writing a social media strategy or getting prepared for a crisis – these workshops will have you covered. I found this guide really useful, particularly the area when you acknowledge that is OK to say that we don’t know the answer yet but are working on get it. Guides like this helps us realise that engage in social media is not as daunting as some people might think it is. Thanks Ailin, so glad it’s useful! I was on social media patrol for a council for years and I rarely knew the answers off the top of my head. Also, rants and insults and lots of support and chat about the great things that were happening out there and even the odd compliment from our switched-on, friendly and passionate communities. * and charming people into dropping what they’re working on to help you get accurate and quick answers! The internal stuff is a trickier than ‘the public’ I reckon! Simple but brilliant advice from Helen Reynolds here. That’s clear, and sensible, and is the type of protocol that would help us in Bradford. I have just one question. Are you suggesting replying to everything? There are times when we have received rants, or repeated criticisms from persistent individuals. I’m not convinced such people always want/expect a reply (regardless of whether our social media team have the capacity to do so). Thanks, glad you like it! I am suggesting that effort is made to answer anything and everything. I know that resources, especially in local government, are scarce but in most instances aiming to respond is do-able. I work on the principle that answers = respect. *Angry people ranting may well have started out polite but got increasingly frustrated by being moved from one person in your organisation and other services to the next, and end up feeling like they’re being ignored or messed around. It happens a lot. We don’t always know what they’ve been though and have a chance to try to satisfy them. *Social media shouldn’t be too different to other customer facing services and we wouldn’t encourage, say, a receptionist in council offices to stay silent or walk away if somebody visited and said something critical or rhetorical. A ‘your comment has been noted’ would do in many cases as a minimum. *In a local government context, no person is more important than another – just because someone is critical it doesn’t mean they should be treated differently to someone who isn’t critical. *My personal experience is that when those who are most frustrated get answers they are satisfied with, they become louder supporters of what you do than those who were always satisfied. I wonder if there is a psychological explanation for this? Or perhaps the people I’m thinking of in this case just don’t hold a grudge. One or two ‘persistent’ people said a fond farewell when I left the council I worked for recently, they appreciated the efforts my team made even if they’re still a bit iffy about the answers! It’s hard not to be biased and bring your personal values to work though. The posts I didn’t answer tended to be racist or misogynist. In my personal life I like swearing so that never bothered me but I was afraid if I answered bigots I may venture into ‘banging my head against a brick wall’ territory. I await opposite views and convincing arguments otherwise! Replying to everything is something I’d encourage as a strategy – agree that it engenders a professional image, and can frequently disarm people who are angry or frustrated. It personalises your service – one of the biggest criticisms of councils are that they are faceless bureaucracies. That’s an accusation that’s a lot harder to make when someone’s comments don’t disappear into a black hole and are in fact answered, swiftly and in a friendly way by a real person with a name. A response shows that someone is listening, and that the commenter is part of a conversation. It also shows that they’re accountable for what they say – not just daubing something on a wall or shouting something over a parapet and walking off. That said, it’s clear that there are times when people are just spoiling for a fight no matter what you say, or have a grudge, or a problem that far exceeds your remit in being able to deal with. In those cases, my advice is that you should respond only once at most, and your response should ideally be shorter than theirs. Sounds an odd rule doesn’t it? My thinking is that it presents them with the dilemma of whether to push on, demanding more and more, appearing more “ranty” than before, or to acquiesce. Ignore subsequent comments if they continue to be unreasonable, and they’ll appear exactly that – unreasonable. An economically written response will do wonders in making you look like you’re just indulging someone with an axe to grind, but don’t intend to be drawn in. Get involved in a protracted to and fro, and you’re down on their level. In these situations, it’s not the individual you need to convince of your professionalism (it doesn’t matter what you say to them), it’s actually everyone else who’s reading. Much vigorous head-nodding here from me! Thanks for the comment, I’m with you there. By and large I am in total agreement with you (and James) and I’m also nodding my head. When I started this job last year I was surprised by just how many comments and questions on social media were being left without reply. I have helped to address that, and our social media team now respond to far more than previously (I used a similar comparison to yours about the receptionist – if someone rang our contact centre they wouldn’t be hung up on – social media customers should not be disadvantaged due to the channel they chose to use). The people who we don’t respond to are mostly those spoiling for a fight, as James puts it, who have repeatedly been making similar comments over and over. But our non-reply policy (with a small p) extends further than that, to include rants, if those rants don’t have a genuine enquiry hidden in them. Thanks for posting this, and hope you don’t mind, but I have shared this with a small group of local authority staff who manage various social media accounts in Torbay as a great example of how to respond to tweets/comments. It was greatly received! I’m delighted that you’ve shared it Jo, so glad it’s useful! Thanks for this, and for the comments – really helpful information. I work as a Communications Officer at a Housing Association and I know the housing team are worried about getting tirades of abuse and how to react to it, so I’ve just shared this with them! 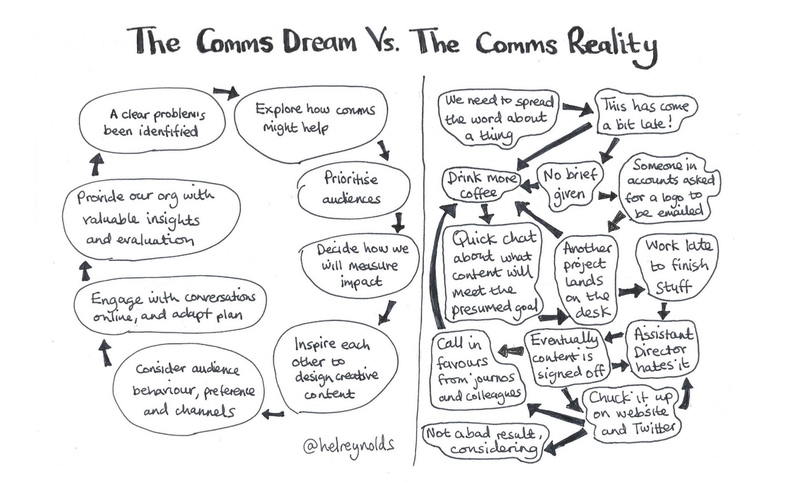 This chart demystifies a common issue for so many communicators on social. The bottom line is, it’s OK to say you don’t know the answer and are taking the time to find out. It’s all about giving due attention on social media – and being honest! Thank you very much for sharing this chart. I too get caught out trying to hand over Twitter in half an hour so I have already shared this around my team and hope it will make future handovers less painful! My pleasure, I’m glad it’s useful!